Many Federal programs are on the chopping block by Republicans in Congress. The Supplemental Nutrition Assistance Program (SNAP) is one such program. SNAP provides essential food assistance to families that are between jobs—and in the current economy, for many families with one, or even two, working adults. The current Congress is looking to reduce the food stamp program by cutting the budget and adding rules that are simply aimed at dropping needy families from the program. This is all being done at a time when the wealthy are receiving more and more tax breaks and assistance from the government. Food stamps not only help the families who need basic nutrition assistance, but the money spent on SNAP significantly supports our nation’s farmers, including the farms in Ohio’s rural counties. SNAP also supports senior citizens, helping to keep them out of poverty. The SNAP program is truly a win/win. 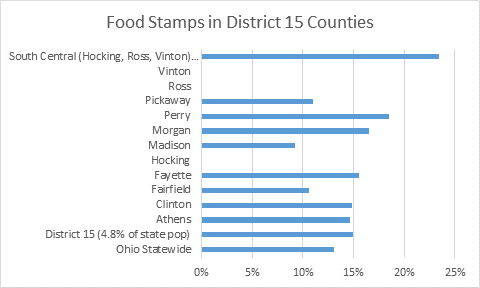 District 15 rural counties particularly benefit from the food stamp program. In all but 3 of the 11 rural counties in District 15, the percentage of families participating in the program is higher than in Ohio as a whole. Many children and families, and many of our local farms, will be negatively impacted if SNAP is reduced or altered in an effort to drop needy families. Nearly half of the households who receive SNAP benefits in District 15 have children in them.